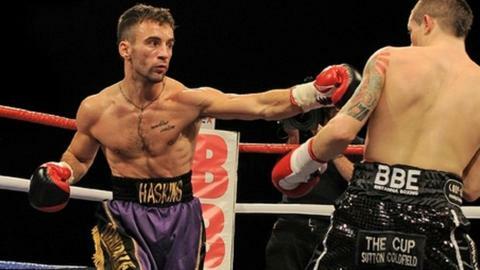 Lee Haskins has won the right to stage a European title fight in his hometown of Bristol but has just two weeks to secure a date and venue. Haskins, 28, has been given the opportunity to face Belgium's Stephane Jamoye, 22, for the vacant European Bantamweight title this summer. The contest must happen in the next 60 days and promoter, Jamie Sanigar, has just 14 days to finalise the location. "To fight here would be wicked," Haskins told BBC Radio Bristol. "It's been a few years now so to be back in Bristol would be good." But Sanigar faces an uphill battle to secure Haskins a home advantage as Bristol does not have a permanent boxing venue. In the past, events have taken place at Ashton Gate - home of Bristol City - and Colston Hall, a concert hall in the city centre. And Sanigar admits it will be a challenge: "We're trying to think outside the box. "We're thinking about marquees that are going to be up in the summer for other events, and see if we can tag on the back of them. "We have two weeks to find somewhere and submit that to the Boxing Union. It's all hands on deck at the moment. He added: "On paper it looks like a great fight - we've just got to find a home for it". Haskins was given the chance to win his first European belt after fellow Briton Jamie McDonnell relinquished the title. Along with Jamoye, he is ranked in the top 10 by the WBC and whoever wins the European crown will move closer to a world title shot. And despite the uncertainty surrounding the bout, Haskins insists he is prepared for the contest. "I've been in training for a long time, just in the gym," he said. "I'm super fit at the moment and as soon as he gets me a date I'm going to step it up even more. "Right at the moment I'm on top of my game. I'm ready for anything and I'm looking forward to getting in there."